Have you ever heard a scientist talk and wondered what the hell they were saying? Did they use the word theory to mean something other than “I reckon”? Well, you’re not alone. 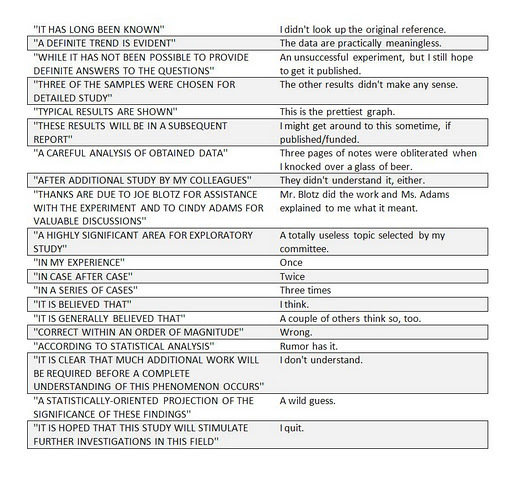 Language is very important to scientists. Without precise language there would be no way for them to write peer reviewed papers that could send an insomniac to sleep. Communicating science is all about letting everyone in on the data and knowledge that is being accumulated in the endless march forward into the unknown. But because scientists are marching into the unknown, they prefer to make their statements as vague and non-committal as possible. This way, if they are correct they have cautiously alluded to the right answer, and if they are wrong they can pretend their statement was hinting at the correct answer all along. In keeping with my previous explanations of music reviews and book reviews I have found a chart explaining science terms. This list has helped me, I hope it helps you too. Previous Previous post: Modern Music Su….